In the latest round of fantasy budgeting, the Republican House on Thursday narrowly voted to slash federal food stamp funding by nearly $40 billion over the next decade – a move that if allowed to stand would boot 3.8 million from the nutrition subsidy program amid a tough economic recovery. The debate allowed the Democrats to vilify the Republicans as heartless misanthropes trying to take food out of the mouths of children and veterans. Republicans, meanwhile, railed against waste, fraud and abuse in the costly program and stressed the need to force more recipients into jobs. Yet many agree that this draconian cut will never pass muster with Senate Democrats or President Obama, and bears little resemblance to what Congress is likely to approve as part of overall agriculture and nutrition legislation before the years is out. Instead, the symbolic cut – which is ten times the amount approved by the Senate last summer and twice what House Republicans had earlier proposed – helps set the table for an unprecedented fiscal food fight this fall that may well trigger a government shutdown and the first ever default on the U.S. debt. House Speaker John Boehner (R-OH) has promised a “whale of a fight” with the White House over the debt ceiling and a spending bill to keep the government operating beyond the start of the new fiscal year Oct. 1. Under pressure from about 40 conservative and Tea Party members of the GOP caucus, House Speaker Boehner (R-OH) has scheduled a vote today to keep the government open through Dec. 15, provided funding is eliminated for Obamacare. Then, as the Treasury runs dangerously close to exhausting its borrowing authority by mid-October, House GOP leaders say they will demand a series of concessions from the president in return for agreeing to raise the debt ceiling. Among those demands: additional deep spending cuts, authorization of construction of the Keystone XL pipeline, tax reform and a one-year delay of Obamacare. Obama said earlier this week that he will refuse to allow the Republicans to use the debt ceiling as a bargaining chip, as he did back in 2011 during talks over spending and new borrowing authority. But Boehner merely shrugged off the president’s statement yesterday. Thursday’s close 217 to 210 vote (with 15 Republicans opposing the cut) was the latest chapter in a year-long battle over federal funding for food stamps, officially known as the Supplemental Nutrition Assistance Program (SNAP). Over the past four decades, Congress has considered spending on food stamps and agriculture subsidies in tandem, enabling urban and rural interests to find common cause in passing the costly measures. that tradition by splitting apart the farm bill to consider the food stamps section separately. The House narrowly approved about $195 billion of crop subsidies and reforms over the next 10 years, and then waited until Thursday to pummel the food stamp program. The bill would cut SNAP funding by tightening the eligibility requirement for “able-bodied” people with no children to find work or actively seek employment. The largest savings, of roughly $19 billion, would come from eliminating the ability of states to waive work requirements for able-bodied adults in states with high unemployment rates. In effect, Republicans are seeking a tough work requirement, to either weed people off the subsidy or force them to look for jobs if they aren’t doing that already. Yet more than 40 states want to extend those waivers to assist low-income resident struggling to weather the economic recovery. Another $11.6 billion comes from updating how the Department of Agriculture determines eligibility. Poor people would no longer become “categorically eligible” for food stamps by virtue of qualifying for other benefits. That change alone would result in 2.1 million people losing food stamps in 2014, according to a Congressional Budget Office analysis. The food stamp program is geared to responding to the ups and downs of the economy: in bad times, the rules are loosened and spending goes way up; as the economy improves, as it is doing now, the spending comes down. Annual spending on food stamps was just $15 billion back in 2000. But spending doubled under Republican President George W. Bush and doubled again under President Obama to reach a total of $78.4 billion last year. 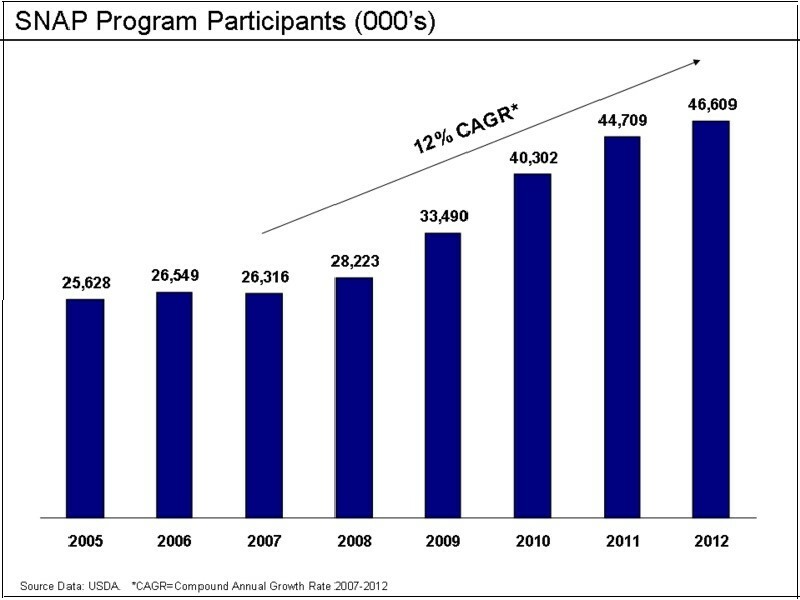 Over that same period, recipients more than doubled, from an average of 17.3 million in 2000 to 46.6 million last year. During that time, the average benefit per person rose from $72.62 a month to $133.41 a month, according to the Department of Agriculture. Notably, the sharp increase in food stamp usage did not come from a sudden rise in grocery store prices, but from the impact of the worst recession of modern times. More than 90 percent of SNAP expenditures are for food assistance benefits for low-income households, according to the Center on Budget and Policy Priorities. But as guidelines were loosened and the Agriculture Department aggressively encouraged the poor and elderly to sign up, the profile of recipients changed somewhat to include more formerly middle-class people and college students who, in most cases, were struggling to pay tuition, room and board. SNAP grew rapidly between 2008 and 2011, reflecting the rising numbers of Americans who lost their jobs and the rising number who were struggling to make ends meet. The number of individuals receiving SNAP in an average month grew from 26.3 million in 2007 to over 46 million in 2011. SNAP enrollment growth slowed in 2012, however, as the economy began to recover and is projected to shrink as a percentage of GDP in the coming several years. Even without the House action, food stamp spending is due to decline beginning later this year. The 2009 Recovery Act’s temporary boost to SNAP benefits is scheduled to end on Nov. 1, resulting in a benefit cut for every SNAP household. For families of three, the cut will be $29 a month — a total of $319 for November 2013 through September 2014, the remaining months of fiscal year 2014, according to the Center on Budget and Policy Priorities.